Kennington People on Bikes (http://kenningtonpob.blogspot.com/) is a new blog set up by Lambeth Cyclists member Charlie Holland with the aim of getting more people in Kennington on bikes – it is a very interesting read dealing with cycling issues local to the ares in the North of the borough around Kennington. "Look at those big, isolated clumps of buildings rising above the slates, like brick islands in a lead-coloured sea... Lighthouses, my boy! Beacons of the future! Capsules, with hundreds of bright little seeds in each, out of which will spring the wiser, better England of the future." Sherlock Holmes' words suggest the great visual impact the new buildings of the School Board for London had on the cityscape between 1873 and 1904. This ambitious programme produced buildings that still dominate the skyline of London's inner suburbs, with their instantly recognisable rooflines, towers and range of architectural embellishment. The tour took in a variety of the buildings, both those still operating as schools and some exciting conversions to new uses. Led by James Hall of conservation architects Peregrine Bryant. 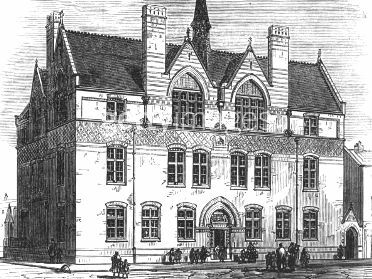 Illustration shows a new boarding school in Harper Street, New Kent Road, which belongs to the Lambeth division of the London School Board, 1874. Cycle superhighways: how are they for you? Amid some fanfare Boris Johnson launched the cycle superhighways on Clapham Common at the end of July including CS7 travelling through Lambeth up to Southwark Bridge. Now that we are almost two months into the scheme how have you found the new routes? The feedback we have received has not generally been very positive with a feeling that there had been no general improvement to journey times or cycling as a result of the initiative. Concerns have been expressed about the junctions at Clapham, Stockwell, Kennington Park Road and near Oval tube station as well as a general resentment that car drivers now expected cyclists to be in the lanes rather than us being able to choose the best position in the road for the conditions. Several people felt that the roads have become more dangerous around the junctions as a result of the scheme. Other concerns related to the lack of enforability of the routes, the discontinuous nature of the lanes and the general missed opportunity to promote cycling and waste of resources. If you have any concerns/ issue with the routes please report them to TfL – email LONDONSTREETS@tfl.gov.uk. Please copy in the Lambeth Cyclicts email address as well so that we can monitor feedback and draw out any trends. CS7 is a pilot superhighway so we are hopeful that TfL will take on board some of the criticisms and make changes to the next routes being built.